Organizational Development (OD) is a proactive approach that embraces change (external and internal) and leverages it for renewal. Its purpose is to enable an organization to better respond and adapt to a VUCA environment, thus to industry/market changes, customer needs and technological advances. By promoting change, organizations fit their surrounding environment better and are more effective in achieving the goals. OD generates systemic change that affects all aspects of an organization. It also requires modifications in employees’ beliefs, attitudes and values for both individual and organizational growth. To understand the relation between the external factors (environment triggering the change) and internal processes (employee development, internal communication, product, and service enhancement, etc. ), the Model of Theme Centered Interaction (TCI) created by Ruth Cohn proves to be valuable. TCI helps us identify the various forces that drive an organization forward, and how to foster their productive interaction towards a healthy dynamic balance. Internally, the driving forces are the individual employees, the groups they form (interaction between individuals), and the objectives these individuals work on together (products, services, projects). This can be represented by a triangle, where the individual, group and outcome form the three points. The individual and group points represent the base of the triangle that makes the achievement of the objectives, the top point, possible. The triangle is surrounded by a globe, representing the environment or context. Any change in the environment calls for an adaption for the organization to remain competitive, impacting the balance of the triangle – shifting, in alternation, the weight from one point of the triangle to another. In OD, the needs and interests of the three points have to be constantly addressed. One must also avoid one point becoming too dominant, and thereby throwing the triangle off balance. TCI emphasizes two principles that are crucial in handling the human side of OD: personal autonomy and interdependence. The first one (“Be your own chairman”) calls upon the individuals to “listen within,” thus becoming aware of their own feelings and needs, voicing them, and taking responsible actions upon them. The second one (“Disturbances have precedence”) insists on “listening outside,” thus identifying disturbances and confusion affecting the group dynamic. They have to be noticed, voiced and addressed in order to allow change processes to be successful. → TCI is an outstanding compass in any Organization Development work. 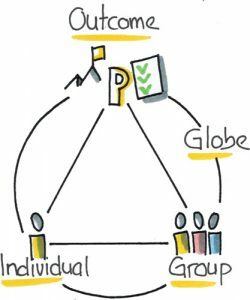 Context mapping helps us identify the outer forces impacting the organization, while the triangle guides us in transition management. * Ruth C. Cohn (1912 – 2010), US American and Swiss psychotherapist and educator, best known as the creator of the theme-centered interaction (TCI).